Oil-spill science is not strictly business, it’s personal, too. The Deepwater Horizonoil spill felt very personal to Dr. Patrick Fitzpatrick a Mississippi State University (MSU) scientist researching storm surges, who is also an avid saltwater fisherman living in south Louisiana. He kept close tabs on the situation unfolding “in his backyard”. He directed several research projects that investigated oil transport in specific regions along the Gulf Coast, modeling the influence of weather systems and the potential impacts of hurricanes, on the movement of the oil. 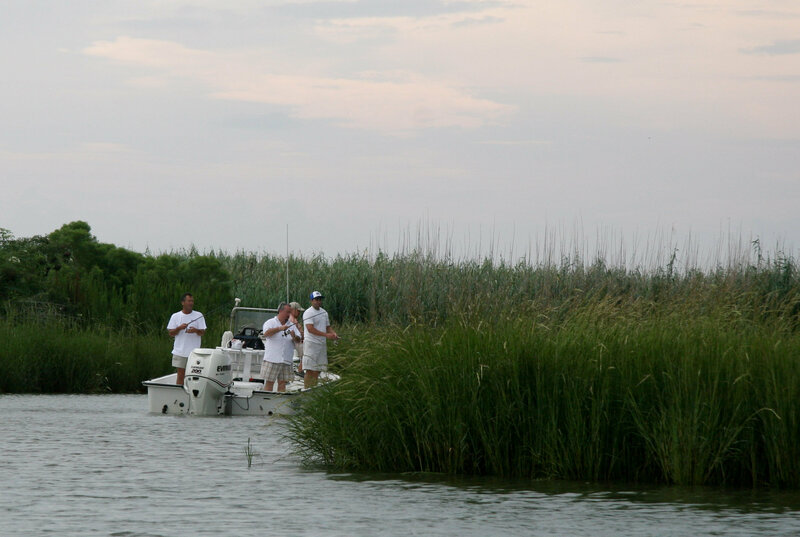 Fitzpatrick noticed that in first six weeks of the event, the oil transport had preferred routes, impacting some areas while other areas such as Lake Pontchartrain, Lake Borgne, and the marsh to their east stayed relatively oil-free. 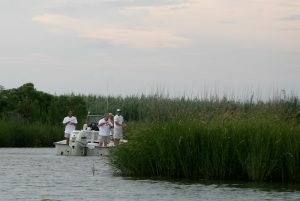 Supported by several Gulf of Mexico Research Initiative (GoMRI) grants, Fitzpatrick and his team – in the first phase of their research – identified late June to early July 2010 as a period of scientific interest. During this time, oil briefly impacted the Rigolets, Lake Borgne and the western Mississippi coast, representing the innermost penetration of oil pollution east of the Mississippi River. 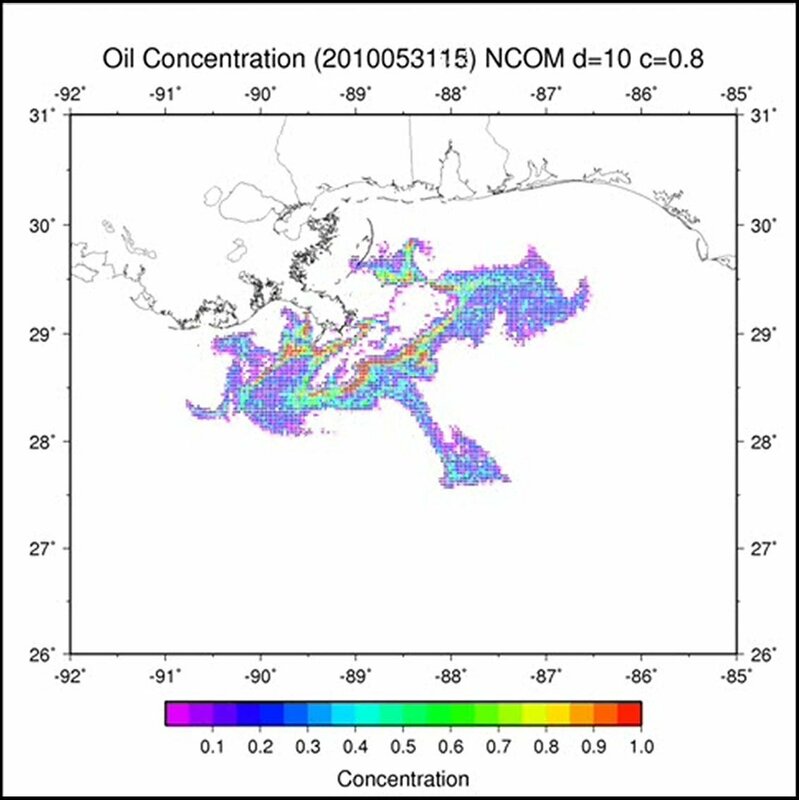 Fitzpatrick developed an oil spill simulation for the June 20to July 10 time period incorporating meteorological and ocean data to help understand the influences on oil movement. For the second phase of this study, the research team expanded the oil spill simulation to cover the period of May 25to July 31. 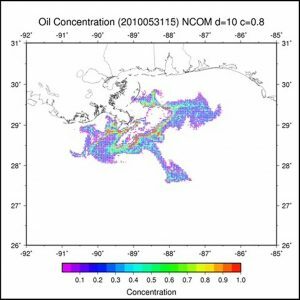 Because ocean currents and weather processes influence the movement of oil, researchers tested a trajectory model integrating weather data which suggested that oil movement could suddenly be altered by any low pressure system in the Gulf of Mexico. A video of the simulation is available here. Fitzpatrick says the movement of the spill was actually influenced by Hurricane Alex which made landfall in Mexico (as seen in simulation video around 0:35) and another non-tropical low pressure system which pushed more oil onshore during July. From this research, Fitzpatrick and his team created a trajectory model which can be used in any future pollution events. They also worked on a database of the oil impacts. The database will help validate the model, but also will be useful to other scientists. Their research findings have been submitted to the International Journal of Remote Sensing. Fitzpatrick, an associate research professor at MSU’s Geosystems Research Institute, became interested in meteorology as a young boy from his time fishing on a boat with his father and learning the importance of being constantly alert to changing weather conditions. Dr. Fitzpatrick received his B.S. and M.S. degrees in Meteorology at Texas A&M University and his Ph.D. in Meteorology from Colorado State University.